Early on in the race the two established a comfortable lead ahead of the field, and by half way were jostling for dominance. Going through the 5km mark Masehla was one second ahead with Mhlongo in her slipstream. A relaxed and focused Masehla loped to the finish only after nudging ahead of Mhlongo as she entered the stadium. As she entered the finishing chute the victorious runner did not waste time looking back, and hopped joyfully as she broke the tape. 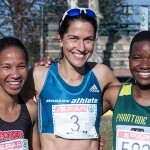 Masehla’s last race was the Totalsports Women’s Race on August 9 in Johannesburg where she came second in a time of 36.34 behind Lebogang Phalula. 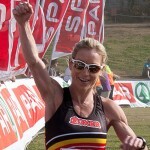 Next up for is the Mandela 21 km and the Sanlam Cape Town Marathon at the end of September . 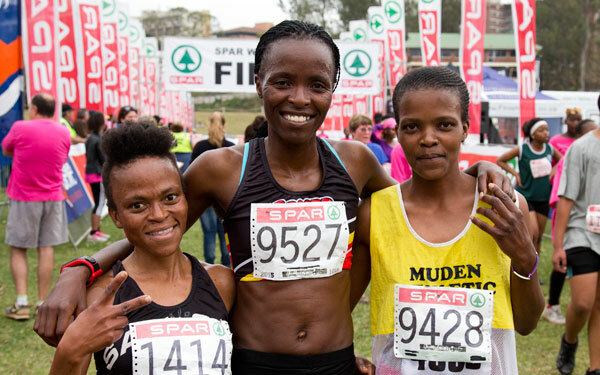 Rounding off the top three was Muden runner, Lindokuhle Gabela after almost a three minute gap in 39.17. 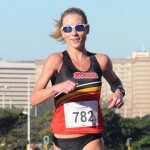 All of the podium finishers had competed in the KZN Cross Country Championships yesterday (Saturday, August 22). The cool, overcast weather made for comfortable race conditions for the record field of 4000 participants.